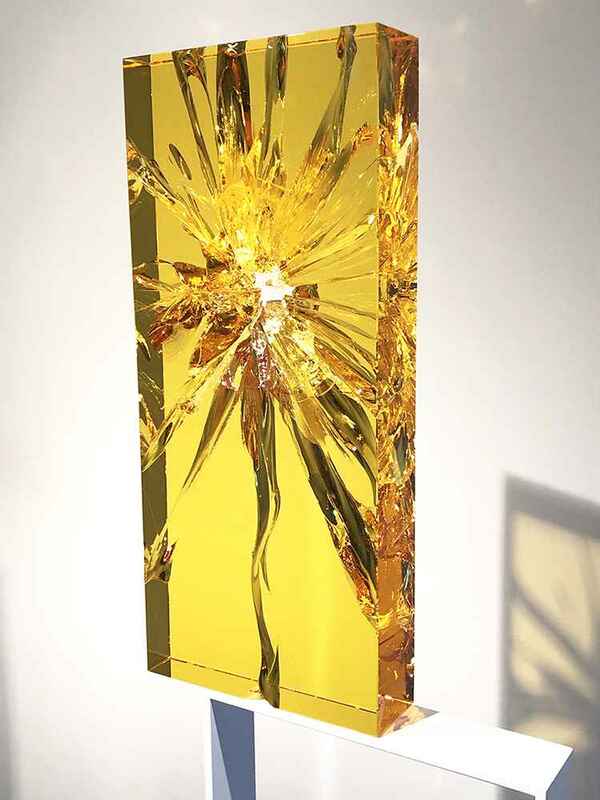 24.38" x 10.75" x 3"
Recognized for the exceptional formal refinement of his blown, carved, and polished glass sculptures, John Kiley (b. 1973) has earned many of glass art’s most esteemed distinctions since his career’s inception at age 19. Trained at the Pilchuck Glass School and the Penland School of Crafts, Kiley worked for Dale Chihuly’s studio at the age of 20 before winning an apprenticeship with both Dante Marioni and Benjamin Moore. Additionally, he has traveled as a principal team member with Lino Tagliapietra for more than fifteen years. One of the most exciting glass sculptors working today, Kiley updates and extends the lineage of these foremost innovators. His pieces examine the relationship between interior and exterior forms, often diluting the boundary between the two to inhabit the cusp of liminal space. His sharp eye for both color and transparency allows him to create surfaces that blur gradients between hues—cutting spheres and dying segments to poise several colors adjacently and to achieve a dynamic spectrum of tinged light that responds readily to shifts in viewing position. Kiley is the Glass Director for the Schack Art Center, in Everett, WA. He is the recipient of the prestigious Artist Residency for the year of 2010 at the Tacoma Museum of Glass, where he has was the recipient of the “People's Choice Award" at the annual Museum Auction. His art has been exhibited internationally, and he has taught glassblowing at the National College of Art and Design in Ireland, the Bezalel Academy of Arts in Israel, The Pittsburgh Glass Center and Pratt Fine Arts Center in Seattle. The artist lives and works in Seattle, Washington.